Gaza Strip - Gazans are crying foul after Egypt stepped up its campaign to wipe out an underground network of transportation tunnels by blasting raw sewage down them, sometimes with deadly results for Palestinian workers. Some 2,000 men and boys work in the tunnel trade in the Gaza Strip. But over the past three months, more than 80 percent have lost the only work and benefits available in besieged Gaza, which remains stuck in an Israeli blockade. That occurred after the government of Egyptian President Mohammed Morsi ordered the destruction of the underground transportation network. As part of that effort, the military began dumping raw sewage into the passageways. It's the most serious - and arguably the most dangerous - attempt by Egypt to close down the tunnels since 2006, when Palestinians began digging the warrens after Israel sealed off its borders with Gaza following Hamas' election victory. 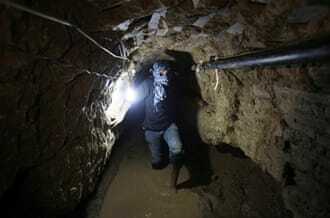 An estimated 30 percent of goods that reach Gaza's 1.7 million Palestinians come through the tunnels. Heralded by Israel as a necessary step to prevent weapons sales into Gaza and to keep attackers out, the blockade has resulted in Palestinians being cut off from many essential items such as food, fuel and building materials. Egypt frequently seals its border in Rafah citing security concerns, as attackers have launched assaults on security forces on the Sinai peninsula by using the underground network. 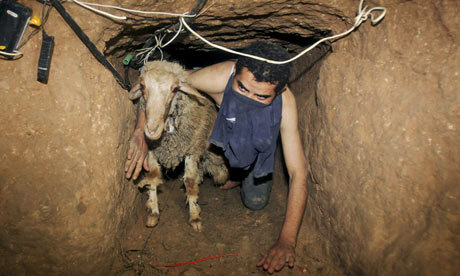 Hundreds of tunnels have been burrowed over the 14-kilometre stretch of land linking Egypt to Gaza. The transportation lines have come at a cost. Israel's Air Force frequently bombs them, resulting in the deaths of at least 20 Palestinians by direct missile hits, according to statistics from the Al Mezan Center for Human Rights. One tunnel owner who identified himself as Abu Suliman said only 50 tunnels are functioning, as opposed to about 550 working at full capacity following Israel's last military operation on Gaza in November 2012. Egypt's Interior Ministry spokesman, Islam Shawan, estimates about 900 tunnels had been operational between Gaza and Egypt until the recent campaign to flood them with sewage water. Israel's air, sea and land blockade of Gaza has led to a booming tunnel excavation business that supplies basic food staples, medicine, and even cars to cut-off Palestinians. Amer, who gave only one name as he feared reprisals for talking about the issue, sits against the wheel of a truck parked on the border area, waiting for a shipment to turn up. Every morning he comes from the north of Gaza to the south in search of work. He has been waiting for eight hours in vain, and is ready to return home empty-handed. The owner of the tunnel where Amer works says it was destroyed by sewage pumped in by the Egyptian military. For the past month Amer, 22, had mostly been hauling gravel, which like all construction materials is denied entry into Gaza by the Israeli government. In the past, he could earn $26 per day, which helped feed his family and pay part of the school tuition for his two brothers. When asked what he plans to do with work opportunities dried up, he looks frustrated. "I don't know. This was the only way I could earn living and put food on the table for my brothers and mom. It may take some time to find another way," says Amer. A friend nearby has a solution: "There is always a way to dig deeper. We dug 20 metres before - now let us dig 30 meters instead," says Mahmoud, who also asked that only his first name be used. But 30 metres is risky work. Many coworkers have died inside tunnel collapses, and it sometimes takes days to find their bodies, the Palestinian men say. The number of workers killed since January is seven, for a total of 236 victims since 2006, according to the Al Mezan Center for Human Rights. Essam Hadded, national security advisor to President Morsi, recently told Egyptian reporters that the move to shut down the tunnels is in response to weapons smuggling, which "shakes the security in Sinai". Last August, 16 Egyptian border guards were killed by fighters near the Gaza border, highlighting the lawlessness in the Sinai desert region adjoining Israel and Gaza. Hamas, meanwhile, says it is concerned over Egypt's move to pump the tunnels full of stinky wastewater. "Tunnels are considered to be the artery of life for the population of Gaza," says Yousef Rezqa, political advisor to Prime Minister Ismail Haniyeh. A tunnel worker from the Al Shaer family in Rafah - who also requested anonymity fearing retribution for speaking to the media - says the Egyptian military recently dumped sewage into his tunnel for the fourth time. He says he and his coworkers are tired of cleaning out the filth, and worry the toxic material threatens their health. Worker abuse is also rampant, with tunnel owners underpaying and overworking the vulnerable labour force. The average excavator works 12 hours a day. Advocate Hazem Hanyia, of the Independent Commission for Human Rights, conducted a study on the tunnels and found that working conditions do not meet minimum safety standards and violate Palestinian labour laws. Amer says some tunnel owners create imaginary problems three or four hours into a shift in order to kick workers out and not pay them for a full day's work. "We never knew there is something called labour rights in this work," says Amer. "It feels like an animal farm, and the tunnel owner comes and collects how much he needs, and he would not mind if we die." It is an unwritten rule that if a single tunnel worker dies his family receives $5,000 in compensation, while a married labourer's family gets $10,000 as a one-time pay-off. But this money often doesn't find its way to bereaved relatives. Bassam Khader disappeared while working underground in Rafah last month, after heavy rain and flooding collapsed a tunnel. His difficult-to-identify body was recovered nine days later, but his family is still without compensation. Khader had a young wife and nine children. Suddenly during an interview, a group of young men surface and hurry an injured worker on their shoulders out of the ground to a medical facility, their faces and clothing covered with mud. An hour later, health officials at Abu Yousef Al Najjar hospital confirm 18-year-old Mohammed Khalil Irbaia was killed by electric shock, as sewage water flooded the tunnel where he was working. When the news of Irbaia's death reaches coworkers at the tunnels they stand silent, remembering how he had been searching for a job just the previous morning. During Egyptian President Hosni Mubarak's time, Amer recalls, soldiers fired tear-gas into the tunnels. Although some friends were killed by the gas, Amer says he fears the sewage water more.